Looking for the PERFECT GIFT for that recently engaged daughter, niece or friend? 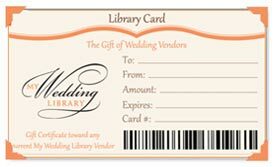 Introducing the My Wedding Library "Library Card." This gift certificate can be purchased at the library for any desired amount, to be used toward everything from Photography to Photo Booth, Florist to Caterer; this certificate can be applied toward any of our current members products or services.